Put down the spoon. And step away from that cereal box. You’re going to want to read this before you eat even one more bite. We’ve been warning readers about the dangers of the herbicide glyphosate for nearly 10 years now. 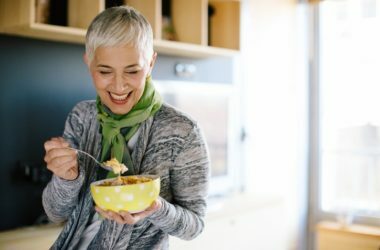 A few years ago, we even raised a red flag when testing revealed the cancer-linked chemical was lurking in some popular breakfast foods including instant oatmeal and bagels. But now a new troubling report has once again put this creepy chemical front and center. And it turns out the contamination problem may be far worse than we ever imagined. I’ll have more about the details on that report in just a moment. But first, let’s take a quick look at this weed killer’s ugly past. Way back in 1970 a scientist working for the Big Ag corporation known as Monsanto discovered that the chemical glyphosate worked as an herbicide. By 1974, glyphosate became the centerpiece for the company’s weed killer Roundup. Roundup quickly became one of the bestselling herbicides on the market. Professional gardeners, groundskeepers, and even home-gardeners started using glyphosate-laced products. Farmers even began spraying it on food crops. And its use skyrocketed after Monsanto introduced genetically modified Roundup ready seeds which were resistant to the chemical. But the troubling evidence against the chemical began to build. Resistant superweeds started to choke out crops in some areas. And studies hinted at serious environmental and health concerns. Fast forward to 2015, and the World Health Organization classified the chemical as “probably carcinogenic in humans.” The same year the European Food Safety Authority concluded glyphosate likely damages DNA. And now just this year in 2018 Monsanto lost a major lawsuit over the safety of Roundup. The EPA still stubbornly refuses to recognize the dangers of the herbicide. But jurors awarded $289 million to a groundskeeper who is dying of cancer. Experts say his terminal cancer is linked to the glyphosate in the Roundup he was exposed to regularly. In other words, the lawsuit confirmed what many of us already suspected. A chemical being sprayed on crops many of us eat could increase our risk of cancer. Now independent testing by the Environmental Working Group (EWG) has revealed just how widespread the contamination problem is. The EWG tested 45 different products containing conventionally grown oats. These included breakfast cereals, oatmeal, and granola bars. And a shocking 31 of them contained significant levels of glyphosate. Which means with every bite of your breakfast you could be raising your risk for cancer. Not to mention a laundry list of other associated health problems from Alzheimer’s to Parkinson’s disease. Well, there’s good news. The advice we’ve been giving you all along is still the best way to reduce your exposure and stay safer. Switch to organic products. Because while they will cost you a bit more, the investment is well worth it. According to the same EWG testing out of the 16 products they tested which contained organically grown oats 11 were glyphosate free. The other five contained only trace amounts of the creepy chemical. But don’t stop with buying organic. Contact your representatives in DC and tell them to start protecting our health and not Monsanto’s bottom line. Demand they follow the lead of Germany and 13 other countries which have already minimized or banned the use of this dangerous chemical.